A Nigerian man and pharmacist identified as Onwuegbuka was reportedly arrested for sexually assaulting an eight year old girl who came for an injection at his chemist shop at Otuocha in Anambra state. 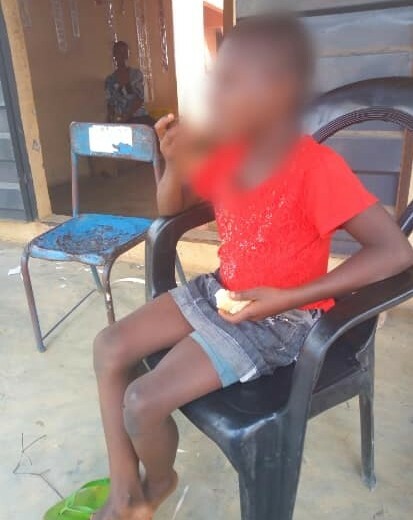 According to the little girl, Onwuegbuka raised her skirt up and inserted his finger into her private part causing her serious pain in the process. It was learnt that he was arrested by the police after a complaint was lodged but later released on bail as the family planned to settle the case with N200,000. "I was sick and my father (Her mother is late) sent me to buy drugs at the chemist shop and also take injection. Getting there the man raised my skirt, removed my pant and used his finger to insert into my private part. He continued until I started having pains and he stopped and warned me not to tell anybody. Getting home I told my Grandmother who reported it to my father".Her father reported the case at Otuocha Divisioner Police station and a medical report was issued to visit a Government hospital. The Doctor confirmed that the girl has been sexually abused (Medical Report Attach). The man #ONWUEGBUKA was arrested and detained in the station. At the Police station yesterday, I met with the Police officers and also the victim father to know his reasons of accepting money from them. He told me he was under duress and accepted the money to enable him treat her child who couldn't sit down due to the injury she sustained and that he didn't agree for settlement. I left the community at about 5:40pm. The case will be charged to court and we will take care of her Medical treatment. Her case will end the tradition in that community that support Sexual Assault on Minors and the girl child. Thanks to Mr. Ogbonnaya who gave us link with Anambra State Police Command, Mr. Greg Elue Okwumbu Greg Okwumbu who tagged me and Mr. Michael who waited for me to lead me to the community to see the little girl and also the Police station, Euphemia Udanoh who kept calling to make sure Due Process was followed. Today, I challenge you to stand up and be bold and speak against evil practices in Africa, Nigeria. We can have a Country we desire if we can speak for those who can not speak for themselves. Leave your comfort zone help us end Human Rights violations in Nigeria."